5 x Paperbacks, over 1000 pages combined! Useful information for our valued readers. The book contains games from 2012 to 2015. Arkadij Naiditsch and Csaba Balogh are analysing the 70 most instructive practical endgames played in 2016. Most Instructive Endgames of 2016 is the continuation of last year’s successful starter “Most Instructive Endgames of 2012 - 2015”. Arkadij Naiditsch was born on 25th of October 1985. His best rating is 2737. Grandmaster since 2001. European Individual U-10 Champion in 1995, Verdun. Silver medal in World Individual U-12 Championship, in 1996 Cannes. PDF Version Text Searchable 5.2Mb. As you may already be aware, the publishing house ‘Chess Evolution’ is printing a series called ‘The Modern Endgame Manual’ which will consist primarily of nine books and will deal with everything concerning the endgame. A total of nine books will take you step-by-step from king & pawn endgames all the way through to extremely complex and materially-unbalanced endgames. This one is the third volume of the Modern Endgame Manual dedicated to knight and knight vs bishop endgames, written by written by 3 of the world leading experts: FIDE Senior Trainers IGM Mikhalchishin, IGM Grivas and IGM Balogh. The authors have collected the most important theoretical positions - which are the base of any kind of endgames - and combined them with many different practical examples. PDF Version Text Searchable 5Mb. This one is the second volume of the Modern Endgame Manual, written by written by 3 of the world leading experts: FIDE Senior Trainers IGM Mikhalchishin, IGM Grivas and IGM Balogh and covers minor piece endgames. Become an expert and learn to enjoy even more the "silent beauty" of the endgame. PDF Version Text Searchable 6.3Mb. The book contains 50 of the most exciting games of 2016. 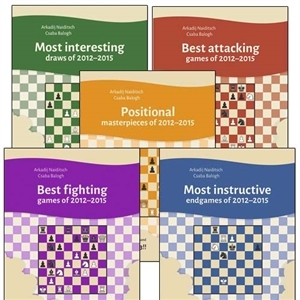 These games from high-level tournaments have been selected and analyzed by Grandmasters Naiditsch, Balogh, and Maze.